Quick overview In 1945, in Kostelec, Danny is playing saxophone for the best jazz band in Czechoslovakia. Their trumpeter has just got out of a concentration camp, their bass player is only allowed in the band since he owns the bass, and the love of Danny's life is in love with somebody else. 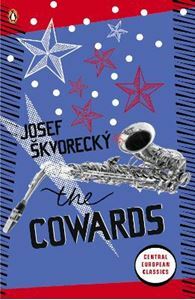 "The Cowards (1958)" is Josef Skvorecky's blackly comic tale of post-war politics that was immediately banned on publication. In 1945, in Kostelec, Danny is playing saxophone for the best jazz band in Czechoslovakia. Their trumpeter has just got out of a concentration camp, their bass player is only allowed in the band since he owns the bass, and the love of Danny's life is in love with somebody else. But Danny despairs most about the bourgeoisie patriots in his town playing at revolution in the face of the approaching Red Army - not least because it ruins the band's chance of any good gigs.